I think I can say with full certainty that crossing the border into Panama was one of the most confusing border crossings I’ve ever experienced (except perhaps when I almost went to Nigeria by mistake on my way to Malawi). 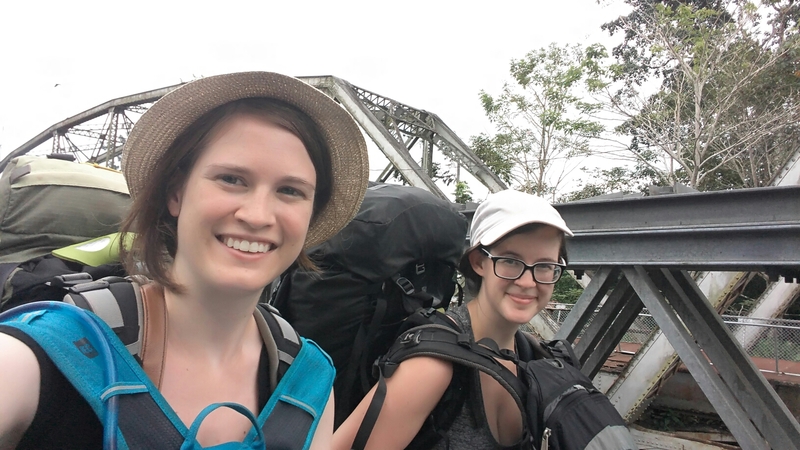 Between leaving Costa Rica and entering Panama we had to go through 4 checkpoints, pay 2 entry/exit fees, and walk across a rickety bridge connecting the two countries. From there we got a bus to Almirante and then a boat to Bocas del Toro, where we spent 4 days. The weather was not good to us and about halfway through our boat ride the heavens opened up and we had the most trecherous crossing through the rain. I’ve never been so relieved to have both feet back on solid ground. 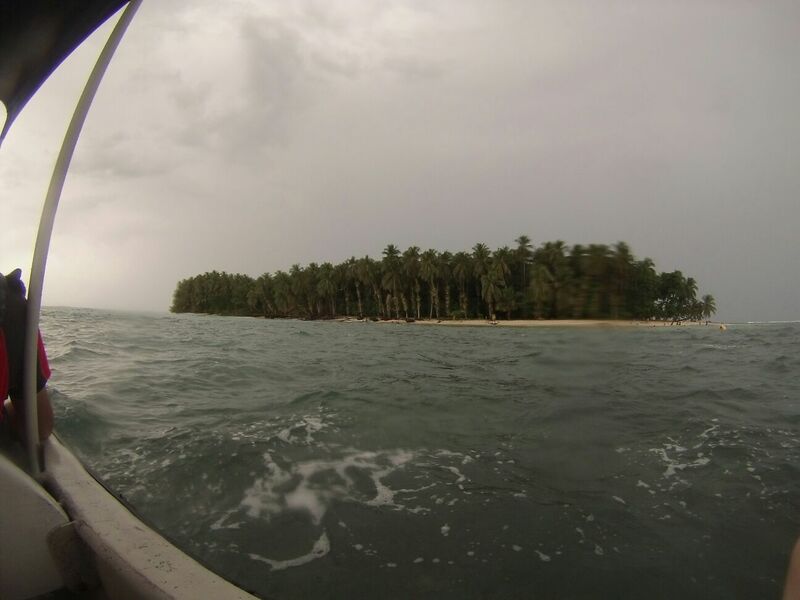 Bocas del Toro is an Caribbean archipelago on the far west side of Panama. Its a popular tourist destination for its beautiful golden sand beaches. Bocas was the longest period of time that we remained stationary and we were anxious to do a bit of relaxing after our quick paced tour of Costa Rica. On our first day we had no plans but to head to the beach. We were staying in Bocas Town on Isla Colon and took a bus early in the morning across the island to go to Starfish Beach. 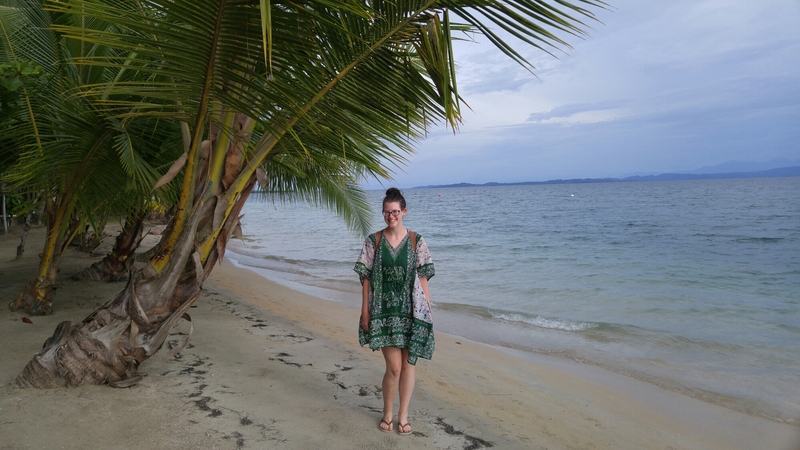 It’s one of the most popular beaches on Isla Colon, but we weren’t sure we were at the right place when we arrived because we were the first people on the beach for the day! We were anticipating rain, so we hadn’t planned to stay the whole day, but the hours kept stretching on and with no sign of rain, we ended up staying all day. Starfish Beach is named for its calm waters that attract many starfish to the shallows. We went snorkeling and spotted quite a few hanging around. 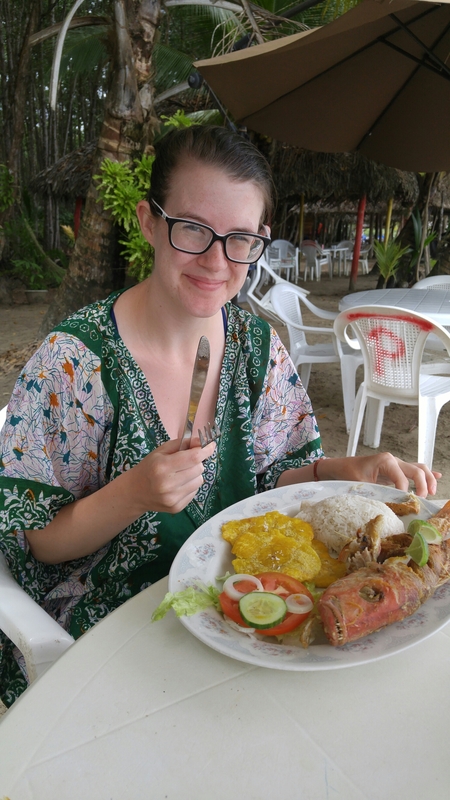 We ate a traditional Panamanian lunch of rice, patacones (fried plantains), and fish on the beach. The fish was red snapper and Emily wasn’t too impressed to have it served to her whole. We had misgivings about 4 days in Bocas when we saw a full week of thundershowers on the weather forecast, but overall the weather was decent. The sun didn’t come out much, but the rain mostly stayed away. It was so hot that a reprieve from the sun was even kind of nice. The exception was our second day, when we booked a snorkeling tour around the islands. The tour started off in Dolphin Bay, where the wild dolphins gave us quite the show chasing our boat around the bay. 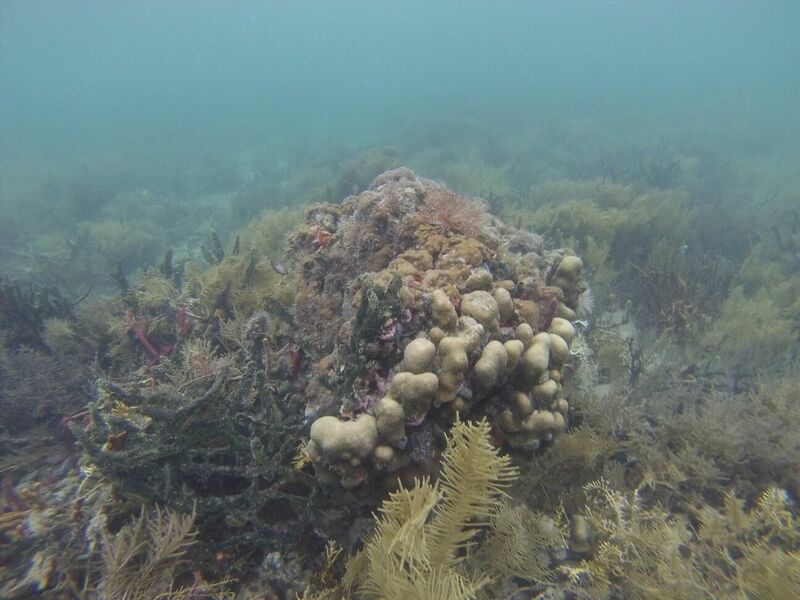 This was followed with snorkeling at Coral Cay, one of the best snorkeling locations in Bocas. We didn’t see much for fish, but there was a lot of coral and it was all very bright and interesting to look at. The main stop of the tour was to Cayo Zapatillas, which is two small islands that are located out from Bocas and are a protected national park. Most of the pictures I’ve seen of Zapatillas are incredibly beautiful, but they were also all taken on sunny, calm days, so it looked a bit different when we were there. Because it’s wet season and the islands are located in open ocean, the waves were very large and the currents were very strong. There is a huge amount of natural reef off the islands though, so it was here that we tried snorkel boarding (aka amphibia boarding) for the first time. Its a clear plastic board that is dragged along behind the boat. You hold on and can steer it through the water behind the boat as you look at the reef. We were expecting it to be a goggle disaster (and it was at some points), but it was also a lot of fun and a different take on snorkeling. Shortly after it poured on us again and we had to take refuge in a little gazebo on the island. Fortunately the rain doesn’t usually stick around too long and it didn’t impede our snorkeling, just our departure since the ocean was pretty rough. 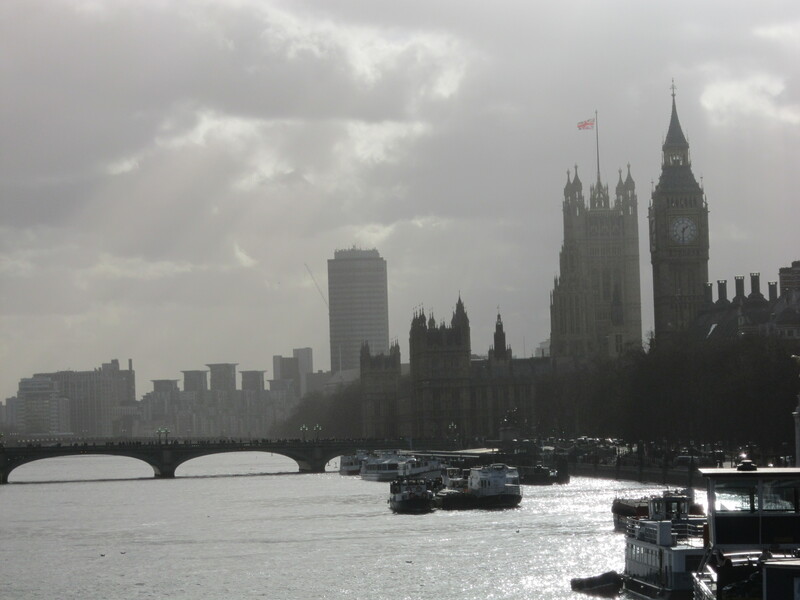 It always surprises me how quickly the rain can start, how intense it is, and how quickly the sun comes out again after! We learned to ignore the forecast, which like Newfoundland, means absolutely nothing. 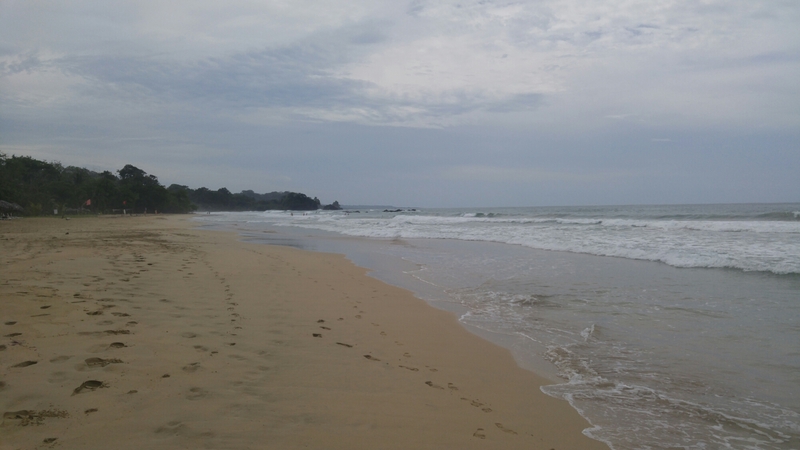 On our last day in Bocas we decided to visit Red Frog Beach and go ziplining. Red Frog Beach is named after the tiny little strawberry poison dart frogs that can be found all over the island. We had a nice morning chilling on the beach before going ziplining. I’ve gone ziplining a few times, but this course was quite different than other ones I’ve done and had a series of obstacles between each of the ziplines. 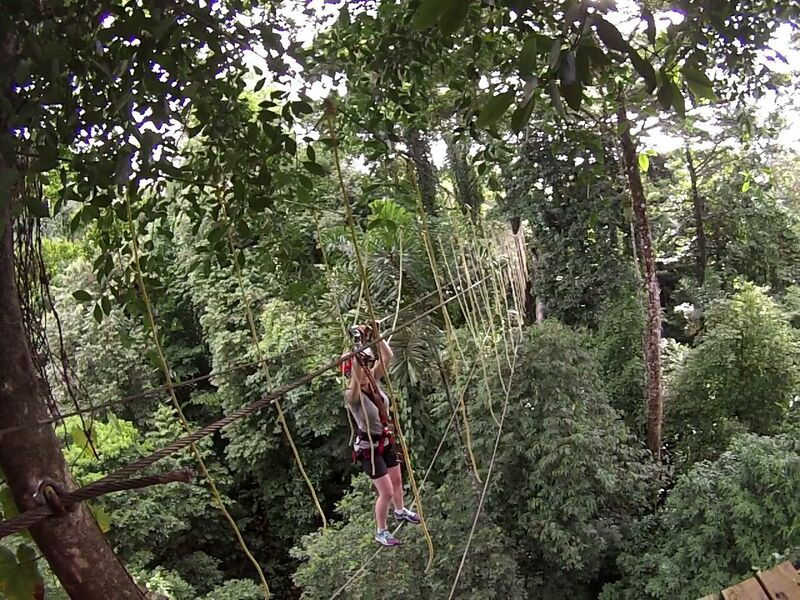 It included a vertical rappel, two suspension bridges, a Tarzan rope, and the scariest, a tight rope. It was extremely long and high, with only a single rope to hold on to above our heads, I don’t think either of us looked down once! 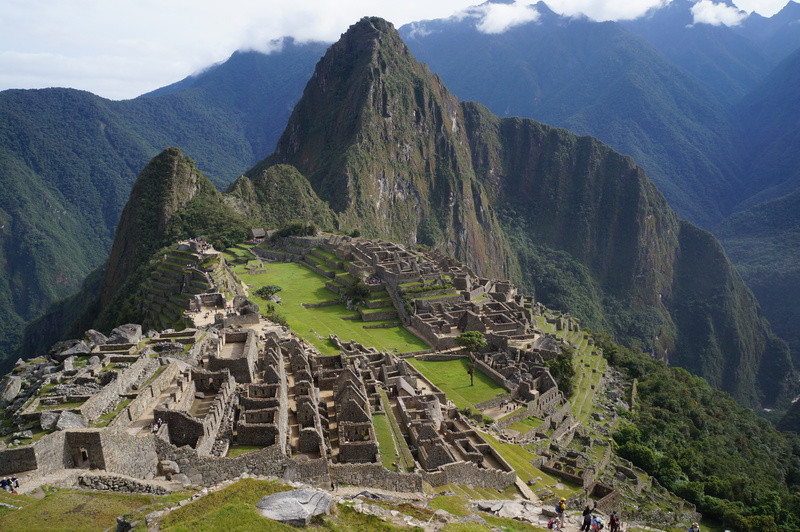 Sadly our trip is almost over now, but we have two more stops in Boquete and Panama City. See you soon! Sounds amazing but more adventure than this old lady could endure! But blast to you!